...thoughts expressed here are not necessarily final. Lewis Agonistes by Louis Markos. This one turns my crank and articulates things I have thought but have not committed to paper. I will look forward to more that he writes in the future. This may be overstating the case, but then again, maybe not. From what I am reading so far, I get flashbacks to the time I was first introduced to Francis Schaeffer's writings in the late seventies. Flashes of insight are regular features of this book. It is written in easy to understand terms and yet communicates with clarity. Markos is an excellent writer and is especially facile at presenting basic summaries of complex philosophical and historical constructs that inform how we got to where we are today. He even ventures beyond this to propose solutions and applications at various times, as a good wrestler should. Lewis was writing in a context in space and time, but so much of what he said has proven to attain prophetically and remains pertinent to our times in a way many have missed. Markos has obviously wrestled with the texts in question mightily. I highly recommend that you read this bridge to C. S. Lewis' works- it appropriates the best of them for such a time as this. Louis Agonistes with stephanos in heroic pose. We live in a time when an English professor may be better equipped to deal with the issues than a seminary trained apologist. The attacks that are attaining in the public square that are coming from the academy are indigenous to hermeneutics and the meaning of meaning. 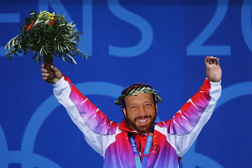 The struggle for victory over the zeitgeist provides a greater challenge than any olympic athlete will ever face. Here is a link to Markos' website at Houston Baptist University with lots of essays on topics that I find interesting. Here is another link to a course he authored on the Life and Writings of C. S. Lewis at The Teaching Company. Thanks to Larry for recommending this one. I took a seminary course on Lewis a few years back and this one looks superior in content. I will be ordering it asap. 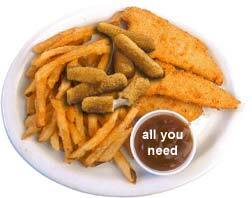 What do you call a sandwich made of chicken fingers, mozzarella sticks and french fries? It's called a Fat Darrell -- and you also can call it a winning combo. The Communist Chinese government continues to crack down on Christians who refuse to compromise their beliefs. Over 100 house church leaders and other Christians were arrested in China earlier this month. In the days following the raid, many family members of those arrested have also been taken into custody, and three other Christians have also been sentenced for exposing acts of persecution by Chinese officials. Todd Nettleton is a spokesman for Voice of the Martyrs, an international ministry that serves and advocates for persecuted Christians worldwide. "Basically the Chinese government is sending the message that no Christians are safe," Nettleton says. "If they don't register with the government, if they don't attend a registered church, they are subject to penalties -- arrest, interrogation, questioning, imprisonment." According to Chinese law, a person can be incarcerated for up to three years without being tried or even having formal charges filed against them. Still, Nettleton notes, the oppressed believers remain steadfast. "We have heard so many stories of Chinese Christians being a faithful witness while in prison," Nettleton says. Voice of the Martyrs urges concerned Christians not only to pray but to take action by speaking out on behalf of their persecuted brothers and sisters in China. Nettleton encourages American Christians to e-mail, fax, or write letters to the Chinese Embassy in Washington, DC. 2300 Connecticut Avenue, N.W., Washington D.C. 20008, U.S.A. I am off to Louisville for a one day course with Edward Tufte.